In this session, we started by looking at two time-weighed cash flow returns, the NPV and IRR. 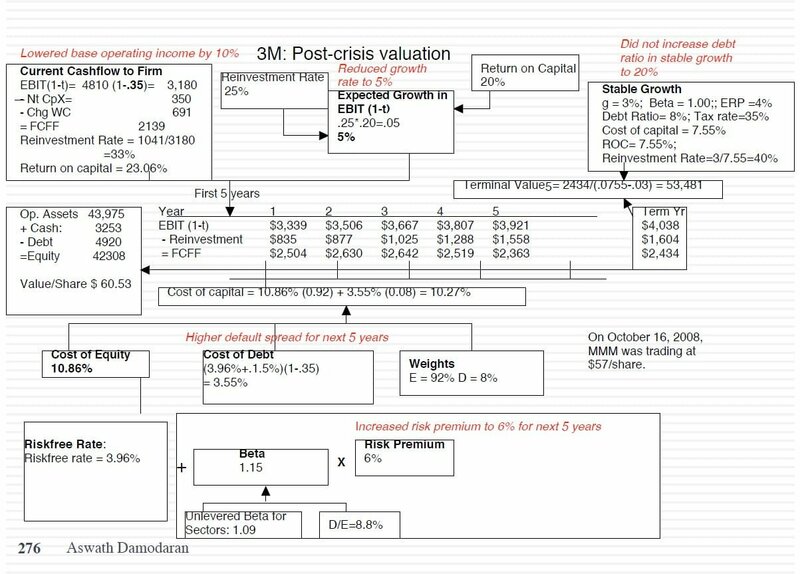 We then looked at three tools for dealing with uncertainty: payback, where you try to get your initial investment back as quickly as possible, what if analysis, where the key is to keep it focused on key variables, and simulations, where you input distributions for key variables rather than single inputs. WUltimately, though, you have to be willing to live with making mistakes, if you are faced with uncertainty. I also mentioned Edward Tufte’s book on the visual display of information. If you are interested, you can find a copy here. It is a great book! I also talked about Crystal Ball in class. You have access to it as a student at Stern, at least on the school computers. You can also download a free, full-featured trial version from Oracle. The only bad news is that it is available only for the PC. As a Mac user, I have to open my Mac as a PC (which kills me) and use Office for Windows (which kills me even more, since I don’t know any of the neat short cuts or where things are in the tool bar). I also promised you a primer on statistical distributions for using Crystal Ball more sensibly and you can find them here. We then turned our attention to analyzing a project in equity terms, using a Vale iron ore mine in Canada and in the process faced the question of whether we should hedge risk either at the output or input levels. If you found the risk hedging question we talked about in class this morning interesting or worth thinking about, here is a paper (actually a chapter in a book on risk that I have) that you may find useful. Guys read the case yet? Hopefully you read the case because that case is due a week from today before class. The reason it has to be before class and it's absolute is we're going to talk about the case in the first 30 minutes of class. So if I let you turn it in after that it's really not fair. Again keep your eyes on the prize. The endgame here is I want you to make as a group a decision. All you do is in service of making that decision should you invest or not. So look at the data. Make your best judgment if you run into a place where you have to make assumptions make assumptions but move on. So last session we were talking about getting from earnings to cash flows, cash flows to incremental cash flows. The last item I talked about was this notion of allocating G&A. How companies especially big companies allocate expenses to projects. And it's really not fair because these expenses have nothing to do with the. And in the Disney case I assume that two thirds of the G&A expense was fixed had nothing to do with the project what. Had. Put it in the real world. The question I have is when I see an allocated G&A item how do I know how much of it is fixed and how much is variable. Because companies don't break down G&A to fix G&A/variable G&A. So I'll give you a very simple statistical device using a very simplistic example and you can extend from this. Let's suppose I gave your company and I gave you three years of history on this company and I gave you the revenues and the G&A cost every year. So the revenues are going from a billion one point two billion one point five billion to G&A cost each year also given. Is there a way. Given that data that you can tell me what percentage of the total G&A cost is fixed and what portion is variable. Is there a way you can tell me given the data. Take the change and revenue and the change in the G&A. For instance the old one my revenues went up by 200 million, my G&A went up by 20 million. All right. So it looks like my variable portion of the G&A is 10 percent of revenues whatever's left has to be fixed. This is a very simple example. Things worked out nice and smooth in real companies you're going to get a lot more noise in the process which means you need more data. And you can you - might need a slightly more powerful tool to eyeball the data you take each year change you're going to get dizzy you run a regression. I know you hated that statistics class you said never again but if you think about the tools you get out of that class you run a progression of change in G&A against change in revenues. You might think this is nothing to the price you. How the hell am I going to do that. This has nothing to do with the project. This is once you get out there and think about Project analysis. It's a simplistic way of kind of breaking G&A cost. I'm going leave you with one final anecdote related to incremental cost because I think it brings home this notion of incremental cost. Remember the incremental cost I said ask two questions what would happen if I take the project what happened if I don't take the project and if nothing changes then it's not incremental. So until about three or four years ago I used to do the analyst training programs for pretty much every investment bank. My Julys used to be packed and to and with one investment bank after the other and I'd get dizzy after about six investment bankers. I had no idea where I was and by the time I got to the end of July I really wanted to get out of there. So this was towards the end of July way back in time maybe 10 or 12 years ago. And I think it was Bank of America Merrill Lynch whichever one it was was one of those hotels updown maybe the Sheraton and there were about 300 analysts in the room and three day corporate finance guys. Basically this glass compressed in time the second day I'm talking about these incremental cash flow I'm ready to get out of there. They're ready to get out of there. But there's a guy who is setting up the catering. Who is the most that tend to push him in the entire room including me because I was speaking on autopilot. But he was listening. So he ended the day everybody in the room please. They want to get home. But that guy comes up and says I have a question. I've been standing in the doorway listening to you for the last couple of days. I have a question. He said I'm from Guatemala and every summer I fly back to Guatemala and before I fly back I go to the limited or the gap and there by seconds. These are closed with the flaws in them. And I spend about six hundred dollars and I getting two second then I fly to Guatemala I sell them for about a thousand. It cost me about 800 dollars to fly round trip and all my company friends tell me I need to stop doing this. I said stop doing what he said when I make a 400 dollar profit it cost me 800 dollars to fly round trip. So it looks they tell me I'm losing money. But I feel like I'm not. What do you think. What's a question you need to ask.